It’s been one year, eight months and 27 days since Jennifer Merendino passed away. 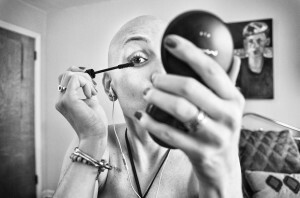 With her husband, photographer Angelo Merendino, Jen documented her struggle with metastasized breast cancer in an intimate and evocative photo documentary series titled The Battle We Didn’t Choose. (Resource spoke with Angelo in May about the project.) This month, the series was released as an e-book, complete with video and narration by Angelo himself. 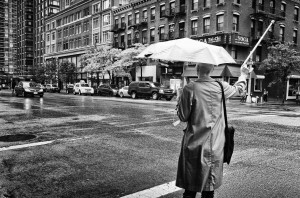 Merendino also opened a show last week at the Cleveland Print Room, Observing and Reacting, which documents the reactions of New Yorkers as he and Jen walked the streets of their Manhattan neighborhood. Resource caught up with Merendino to talk about the book, the show and Jen’s legacy. You released the book, The Battle We Didn’t Choose: My Wife’s Fight with Breast Cancer, September 1st, on what would have been your and Jennifer’s 6th wedding anniversary. Why did you choose that date? It’s a special day, and I knew it would be a difficult thing for me, as these different anniversaries tend to be. And I wanted to do something to celebrate that day. I feel like this book is really a love letter from me to Jennifer, so I felt like it was a kind of gift to her maybe for our anniversary, and a thank you for all that we shared together. For now, the book is available exclusively as a digital download from your website, and is pending approval from Apple for sale as an e-book on iTunes. Why did you choose to release it digitally? Do you have plans to release a hard-copy edition in the future as well? I released this as a digital book for the initial release because I wanted to make it accessible to everyone all over the world, and more affordable. With a digital file, all people have to do is click download and they can have it whether they’re in the United States or Europe or South America or wherever they are. But I do want to have a hard copy one day. When you first started taking pictures of Jen, did you have any idea it would all come together in a project like this some day? No, I didn’t. When I started making the photographs, it was because we were living in Manhattan and most of our family was in Ohio. 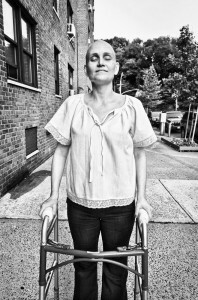 Jen’s cancer metastasized in April of 2010, and as we started treatment again we started to notice that many people didn’t understand how serious Jen’s illness had become. So I started making photographs, hoping that maybe if people saw the photographs they would better understand what we were going through and that we really needed their support. It wasn’t like if I was working on a documentary right now and I would be thinking, “Well, I need these shots,” or maybe I’d work with an editor and we’d discuss things. I was just making photographs a. for communication and survival, for us, and in hindsight I think these photographs were an escape for me, even though I was escaping into the thing that I was escaping from. I still can’t believe that all of this is happening, and I’m very grateful that people want to hear our story. What kind of story do you think the book tells? I think it’s a love story. When I first started sharing photographs, a lot of people commented on how much love they could see in the photographs. I was trying to tell our story about life with cancer, and I’m proud that the cancer couldn’t overshadow how much Jen and I loved each other. 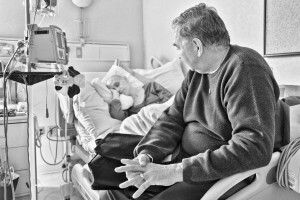 I think there is more love and life in these photographs than there is death and loss. I know it can be hard to look at these photographs, and that they can trigger a lot of emotions in people, but I hope that people will take a minute to get past that initial reaction that may happen when you look at a photograph that’s very emotional. What kind of response have you gotten from people to your photos and to the book? The responses from people have been all over the place. There are people who see how much we loved each other. 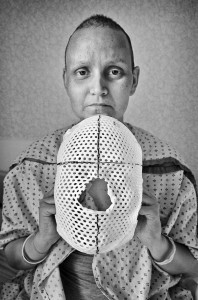 There are people who have cancer who feel that these photographs helped put a face on breast cancer. There are people who are upset by these photographs and who think that I shouldn’t have done this, and that I’m capitalizing off of my wife’s death. But there are also people who have contacted me to say that they scheduled a mammogram after seeing these photographs. It triggers a lot of emotion in people, and I’m happy that what we went through makes people think. What do you think Jennifer would think of the book? I think that she would love it. 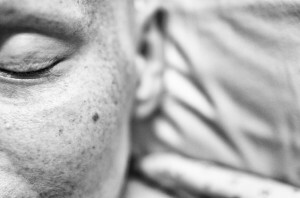 Jennifer, she was sharing her experience of cancer way before I started making photographs (on her blog, My Life with Breast Cancer). 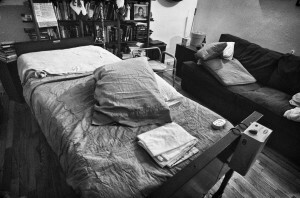 When she was diagnosed in 2008, the things that she was finding on the Internet about breast cancer was very clinical. And she wanted to hear what someone with breast cancer was saying. 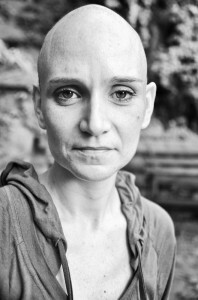 If she was trying to figure out something with her side effects, she wanted to hear from someone who was saying, “I’ve been on this chemotherapy before, and I had this side effect, and here’s what I did to help ease it.” So Jen started to share her experience, and the hope was that if there were other women who were looking for this kind of information then they could find it. She didn’t believe that because this was a difficult situation we shouldn’t talk about it. So I think that she would be happy knowing that something she experienced is helping other people and creating dialogue. We understand you’ve also started a charity, The Love You Share. Can you tell us a little bit about where you got the idea for that organization? The mission of The Love You Share is to provide financial assistance to cancer patients in need while they are receiving treatment. The hope is that by sending a gift card from a local grocery delivery service and reimbursing patients for transportation costs to and from hospital and doctor appointments, The Love You Share will be able to make life easier, even if only for a short time, for someone who is fighting for life. So many people helped Jennifer and me with the day-to-day challenges we faced, and I don’t know how we would have gotten through this without all this assistance. So I wanted to do something that will directly help the person that is receiving treatment. I asked Jen shortly before she passed if it would be all right if I started this organization in her honor, and she smiled and said yes. You have a show up at the Cleveland Print Room, Observing and Reacting, which opened last week. Can you tell us a little bit about the show and where the concept for the exhibit came from? Well, Jennifer used a walker for the last eight months of her life. 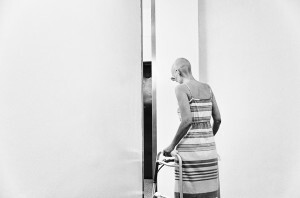 The cancer had spread to her hip, and it was getting more difficult for her to walk. Her balance was shaky as well, so we would go for daily walks. At this point her hair had fallen out, and she carried a pouch over her shoulder that had a pain pump. And we were a young couple. So when we went for these walks, people would stare. There were men and women. There were children. There were adults. There were all different races. It didn’t matter. People would look. Throughout all of this experience, the goal behind my photographs was to share what it was like for us, so I started making these photographs, and I would hold the camera down by my side so that people wouldn’t see it, hoping that I would get as natural and honest of a reaction as possible. And that’s where the exhibition comes from is these photographs that show people, observing Jennifer. You know, we all look at people. As a photographer, it’s what I do. So we weren’t mad that people were looking. But it was also something that was difficult for Jennifer, because as strong as she was, it also reminded her that she had cancer. And it made me think twice about looking at people and what I put out when I look at someone. I was recently asked if anyone ever smiled, and I can only remember two times when someone smiled. One was a child, and one was this woman who, when she smiled at us, it was wonderful. It was nice to get that back in return, instead of a look of confusion. Have you made many photos since Jen passed away? It took a while, not just to feel like picking up the camera, but to start to figure out who I am now, in general, as a human being. It’s been the same as a photographer, trying to figure out who I am and the kind of photographs I want to make. Making these photographs of Jennifer, it was so intense, and I can’t imagine ever making photographs that I am so connected to. So now it’s challenging to not look at a photograph and think, “Yeah but why am I going to make this?” Just to make a photograph because something moves me and not feel like it has to be a photograph that’s going to make change in the world the way these have. I think I have a different respect for the people that I photograph, and a different curiosity about who this person it or what this person is facing in life or where this person has been. Jennifer was 40 when she passed, and she always used to tell me, “Follow your dreams. Live the life you want to live. Life’s too short.” And this was before she had cancer. Now, I know how much I love photography, and I feel like I can do something with a camera that can help other people, so it’s more important to me than ever before to really embrace every second of my life. There’s a sense of urgency in my life that at times can get a little overwhelming. But not knowing what’s coming around the corner is frightening, but kind of exciting, you know? Life is full of possibilities and potential, if you choose to look at it that way.